Each Monday in January, we’re sharing our preparedness New Year’s resolutions. If you’d like to make some Prepping Resolutions of your own, but don’t know where to start, borrow some of ours or use this series to get some ideas. This week we’re talking about Food/Water. Here is what our Emergency Essentials’ bloggers are doing to prepare in 2014. Since I have lots of basics such as beans, wheat, rice, pasta, and milk, and a few just-add-water entrées, I resolve to concentrate on fruits, vegetables, and meats. I know if I have a supply of such items as sausage crumbles, ground beef and chicken, I can combine them with other ingredients to make lots of different meals. The freeze-dried fruits I’ve tried have been absolutely delicious, both as snacks right out of the can and rehydrated, so I know I’ll want plenty of those. My favorites so far are the blueberries, peach slices, and cinnamon apple slices. Yumm! Realizing that our water supply is pretty old, I resolve to change it out this year and be sure it’s fresh and usable. I plan to get a new siphon hose and bung opener to help with this task. My food storage is getting a bit of extra attention this year. I’ve got a smattering of random food storage items I’ve picked up over the years, so this month I’m going to sit down, enter what I’ve got into the Food Storage Analyzer, and determine what I need. I know I’m missing a lot of the basics like wheat, honey, and powdered milk, and I really want to have a food supply that’s nutritionally balanced and that includes food I love. So I’ll be taking a good look at my Food Storage Analyzer results and watching for sales on the items that will fill in the caloric and nutritional gaps I’ve got in my supply. As far as water goes, I’m focusing more on storage and purification than filtration this year. I’ve already got a Katadyn Vario microfilter that I love, so my basic filtration needs are met. I also have a 160-gallon Water Reserve… that’s totally empty. So this month I’m pulling out the hose (even though it’s COLD outside) and filling up my Reserve. I’m also grabbing a few packets of MicroPur tablets so I have something available that will kill any microorganisms in the water sources I come across (since many viruses are too small for microfilters to catch). Um, my resolution is to actually get and store a supply of food and water . . . My husband and I have a couple of cans stored, but I realize those few cans won’t last us for long. I’ve been thinking about what type of cook I would be in an emergency and have decided that I would be an MRE/Mountain House Pouch kind of girl—just add water or just eat straight out the pack. So for my New Year’s resolution, I’d like to gather and store more MREs and Mountain House pouches, but I’d also like to get a couple of #10 cans to make food for special occasions (and for when we get tired of the MREs) during an emergency. I’d also like to get a water filter like the Katadyn Hiker to take on camping and hiking trips during the summer. This year, my family is going to build out our food storage, which, as of now, is no where near where it should be. We want to add #10 cans and MyChoice cans of our favorite meals to our emergency supply and begin incorporating them into our menu. The first few food storage items I want to add to my pantry are Mountain House Sweet and Sour Pork with Rice, Mountain House Diced Chicken, Provident Pantry Fettuccine Alfredo with Chicken, and Yoders Bacon. We will also be adding a 15 gallon water barrel to our pantry to help us store water in case of an emergency where we are unable to access clean water. Along with the barrel, we’ll add a siphon hose—I mean, we have to have a way to get our water from the barrel to our table. 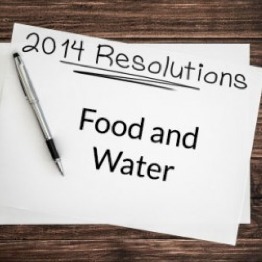 What are you doing to get your food and water supply prepared in 2014? Let us know in the comments!